I’m totally late with this one, as Piglet was 10 months old on Boxing Day. Festivities got in the way of blogging though, and I was enjoying switching off a bit and enjoying the family time. So really, I’m not even sorry! 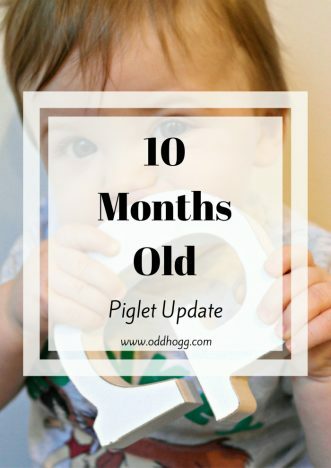 Piglet’s 10th month was a big one for him. He developed in leaps and bounds! Every couple of days he was learning something new, or improving on the basic skills he already had. 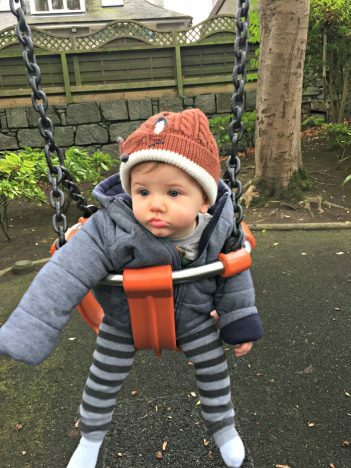 We celebrated his first Christmas, and we struggled through a nasty illness. It has probably been his most eventful month so far – and I think the fun is only just beginning! We finally have a sitter! He is probably about as stable as he’s going to be for a while. On hard floors I still prefer to have a couple of cushions behind him/to the side, but he doesn’t tend to topple over as often now. One transition he has yet to master is how to get from sitting to lying down again. It is not at all graceful – in fact he usually smashes his face off of the ground. But providing the fall was intentional it doesn’t seem to phase him and he carries on as if nothing happened. He’s a tough cookie! Just before Christmas Piglet finally got on the move. I wouldn’t call it crawling….. it’s not even close to a crawl. He acts like he is paralysed from the waist down, using his arms to pull himself forward and dragging his legs behind him. It’s not elegant, but it’s functional and he manages to get where it wants usually. I’m quite ready for him to stop growing now. He’s pushing on the edge of some of his 9-12m baby grows which I’m not too thrilled about – I’d like him to slow down! He’s got a little podgy belly now which is super cute. I haven’t weighed him recently, I hopefully will get around to it for his 11 month update. The start of December brought us bronchiolitis. It is awful sitting cuddling a wheezing baby as there really is nothing you can do! He coped, and came out the other end of it just in time for Christmas. In amongst the wheezing we missed a couple of teeth finally making an appearance. They just suddenly popped through one morning! I’m sure that did nothing but add to his discomfort, but at least it got it over with all in one go! He’s been really quite pleased with himself since they turned up and will proudly rip his food up now. We’ve had a funny old month with feeding. He has become more independent with his meals which I’ve found difficult at times. I’ve had to get a bit more creative with some finger foods for him so he can feed himself. He has also started to get a bit fussier, he knows yoghurt is coming and will often just refuse to eat his meal as he wants the yoghurt. I’ve tried giving him the yoghurt, then going back to the savoury food but he’s having none of it. Menace! Breastfeeding changed a bit when Piglet had bronchiolitis. He had started taking a bottle in the afternoons, but when he was unwell he just wanted Mama and to breastfeed. Obviously I don’t mind that at all! Once he was better again I went back to offering the bottle. I think that if I were to stop breast feeding now he wouldn’t really notice. He is quite happy with a bottle, and holds it for himself finally. I don’t think I will be feeding him for much longer, but I’m glad we made it to 10 months. Not much has changed on the sleep front. I think he perhaps he sleeps a little longer over night as a result of shorter naps during the day. We have been so lucky, but it does mean that on the nights that he wakes once or twice I don’t cope very well! Screeching. I encourage this one a little too much perhaps, but it’s quite fun to be shouting together! 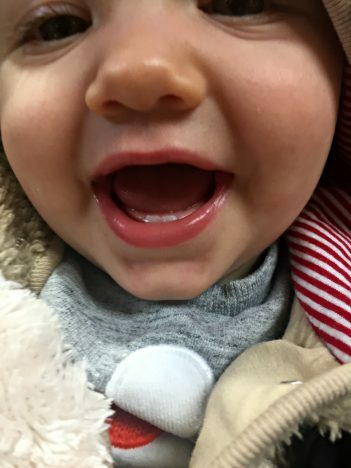 Those little teeth!! You poor bunch with bronchitis this time of year, hope he’s feeling better now. I remember when my eldest had it at a year old and that was tough enough. Thank you. He does love his food….. most of the time! 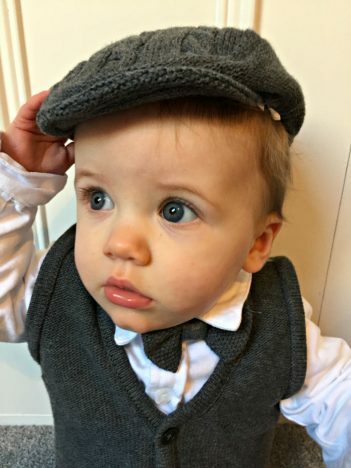 OMG his little vest and Newsboy cap. SO stinkin cute~! Your piglet sounds a lot like my piglet! He enjoys his sleep (which we’re thankful for everyday) but hates having his nose wiped! There a similar age so it’s nice to see what other babies are up to!